From the testimony of combat veterans and their families, a military historian assembles a unique oral history of America’s most controversial war. As the Greatest Generation recedes, Wiest (History/Univ. of Southern Mississippi; The Boys of ’67: Charlie Company’s War in Vietnam, 2012, etc.) offers the sobering reminder that their children who fought in Vietnam, “the 18-year-olds drafted in 1965 will turn 66” in 2013. He readily concedes that the individual stories preserved here are only tiny pieces of the war’s vast puzzle, but taken together, they help explain the military service of a million, largely working-class boomers. Eschewing a chronological or a “big events” presentation, the author takes us through chapters of the Vietnam experience as they unfolded for each man. Wiest groups his soldiers’ stories in sections devoted to their prewar lives, their arrival at various induction centers, their weeks of basic training and their entry into the theater of war. 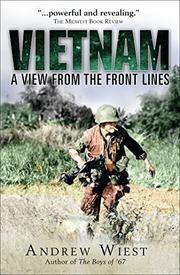 The author follows up with passages on their acclimation to Vietnam, where all learn the dangers of booby traps and mines, the terrors of combat, the hospital trials of the wounded, the changing attitudes prompted by the war’s brutal realities, the exhilarating flight out of Vietnam and the sometimes-rocky re-entry into civilian life. Now, decades after the most searing experience of their lives, these soldiers recall a war likely soon to receive a new burst of attention by a second generation of historians. Sprinkled throughout are interviews with stateside relatives, left behind to raise children, worry about their family members or, worse, receive the dreaded telegram informing them of a soldier’s death. No reader can expect to understand America’s most vexing war through this book alone, but none can comprehend it fully without factoring in these firsthand accounts. A smartly composed, affecting memory album of the draftees and volunteers whose service and sacrifice for so long went unacknowledged. YES, SIR! NO, SIR! NO EXCUSE, SIR!